Audrey Elisabet: Elísabet Ylfa's first birthday. A picture from every month. Yesterday was my Ylfa's first birthday. It seems so amazing to me how fast this year has flown by and still it feels like her birth was in a different lifetime. It is kind of hard for me to recall how everything was before this bundle of joy joined us in this world. She is getting so big and her personality comes through clearer every day. She is a happy little girl, and if I had a dollar for every time a stranger said "happy baby" to us, I would be rich. She loves to hug and kiss. She kisses all of her plushies so much that they all have wet noses all the time. She is in love with animals, specially dogs, birds and elephants (I might have something to do with the last one). She growls all of the time. Her favorite thing in the world are her books and she knows how to sign "book". She flaps her hands constantly at us and pints to the book shelve. She sniffs at all flowers she sees, both real and in pictures, and she wants us to do the same. She dances to every music she hears and her favorite is when grandma and grandpa sing to her a stupid little song about her name over Skype. 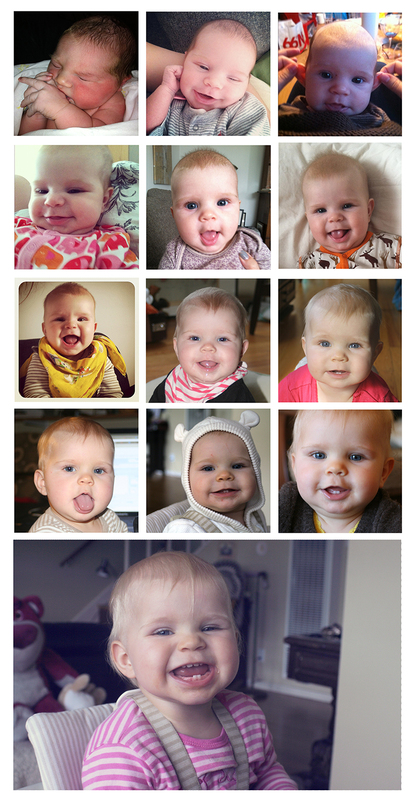 She blows raspberries every single time she my brother Snorri. She knows where her belly and her nose are. Her nose says "beep!" She is so caring and warm and I love her to pieces!